The new service is super compelling, and it's about to explode in popularity. Here's how it got live streaming right. Meerkat has achieved that rare balance of features that make it a crowd-pleasing hit. After using and rooting for Google's Video Hangouts and Hangouts-on-Air features (the latter being a live-streaming video service), I believe I understand why Hangouts-on-Air never took off and why Meerkat will. Here's why Meerkat is so appealing. 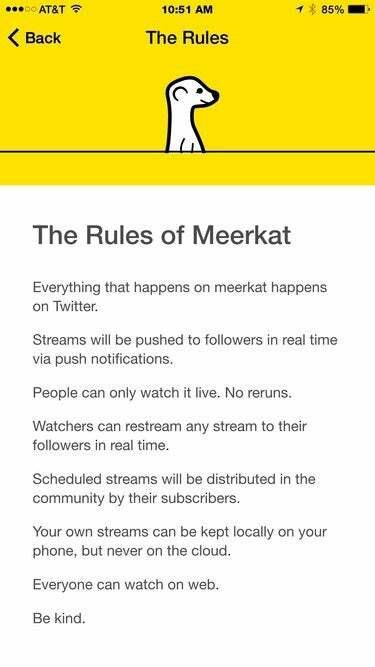 The iOS app spells out Meerkat's rules. If you'd like to learn more about Meerkat and explore this brand-new medium further, I invite you to follow me. I have a lot of Meerkasts where we talk about how to use Meerkat and what it's all about. Just follow me on Twitter (@MikeElgan) and then find me in the Meerkat app.